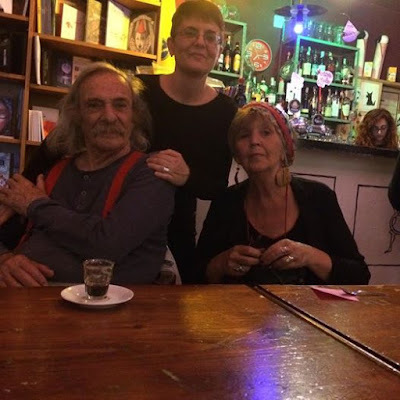 I can hardly write about how wonderful it was to share two full days with Agneta and Jack Hirschman. They are a wonderful couple and I love their spirit. It was simply great to chat with them about poetry, literature, art, life. It was also a chance to learn more about Jack's life and hear quite a few anecdotes that will find their way into the biography I'm writing. Hearing Jack talk of his trip to Europe in 1964-65 was priceless. The months he and his family spent in Paris, in a studio in Montparnasse, while he was researching Antonin Artaud for the Anthology that would be published by City Lights Books. Their trip to Rome by car and the "dolce vita" party they attended. The time spent on the island of Hydra, with friends such as Leonard Cohen. So much history, too: J.F. Kennedy's assassination, the Vietnam War. The years at City College and at UCLA. I had never heard of the gypsy wagon...and how Jack met Pablo Neruda!